To give your child the best educational experience possible, we have launched one of our biggest fundraisers of the year! The MNS Mindspark Superhero Challenge kicks off January 25th with our digital pep rally. Students will experience an incredible S.T.E.A.M themed character program called Mindspark Mystery Lab. They will learn five 21st-century character traits (Citizenship, Zest, Growth Mindset, Integrity, and Teamwork) that will help strengthen themselves and our world. All events take place during the school day and involve all students. On February 6th, students will participate in a 30-minute fitness challenge, led by the Boosterthon team! Please come and support your student as they complete 35 different exercises. We’re so excited to give our students the best experience possible as we encourage fitness and celebrate helping our school, MNS! 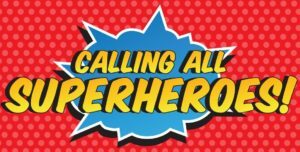 Family, friends & co-workers anywhere in the world can support our School by giving pledged toward the number of exercises your child will complete on the day of the MNS Mind Spark Superhero Challenge! 3. Cheer on your child and the entire school community on February 6 and throughout the events! Look out for the backpacked items that were sent home with your child that will give you more fundraising tips and help you to set a personal pledge goal!